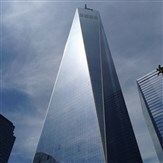 12:00 - 3:00 - 911 Museum- which honors the memory of those killed in the terrorist attacks of September 11, 2001. A historical exhibition tells the story of what happened on 911, including the events at the World Trade Center and the Pentagon and the story of Flight 93. 4:00 - 5:00 - "Freedom Tower" - Ascend to the top of the tallest building in the Western Hemisphere in less than sixty seconds, then look toward the horizon and feel the city's invincible spirit. Immerse yourself in the bustling crossroads of the world at the See Forever Theater. Step onto the expansive Sky Portal and take a walk high above the streets of New York. It is an experience like no other !! 5:00 to 7:00 - free time to visit the Westfield World Trade Center, an instantly identifiable new landmark in New York City where you will find plety of shops and restaurants.